Alabama State Lands Canoe Trails take you through some of Coastal Alabama's greatest public lands. 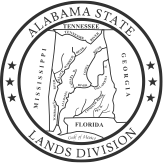 Many of these lands are part of Alabama's Forever Wild Program (administered by the State Lands Division of the Alabama Department of Conservation and Natural Resources). Most of the Mobile-Tensaw River Delta and Perdido River corridor are also enrolled in the Wildlife Management Area (WMA) program, which is administered by ADCNR's Division of Wildlife and Freshwater Fisheries. Adhering to the following list of Recreation Area and WMA regulations will help keep visitors out of trouble, ensure a safe visit, and protect the ecosystem. Disturbing or collecting plants or animals is prohibited. Each boat occupant is required to have a Coast Guard approved personal flotation device (PFD). Children under 8 are required wear their PFDs at all times while in a boat. Because hunting is allowed on the WMA properties, camping is permitted in designated camping locations only. Floating platforms and camping shelters must be reserved through this website. Primitive camping is allowed only in designated areas and is available on a first come, first served basis. Designated campsites are identified on brochure and WMA permit maps as applicable. Fires are allowed in Designated Areas only. Open fires are not allowed on the floating platforms or shelters. The cutting of trees and brush for firewood is not allowed. Canoeist shall not be prohibited from the possession of handguns by lawfully authorized persons for their personal protection, provided the handguns are not used to hunt or take or to attempt to take wildlife except as otherwise provided by regulation 220-2-.55. Fishing is permitted in accordance with Alabama State fishing laws, and regulations (www.outdooralabama.com) associated with the Wildlife Management Area. No alcohol is allowed at camping shelters, floating platforms, or primitive land based campsites including sandbar beaches at Perdido shelter locations. All state, federal, and county laws regarding alcohol consumption are enforced. County regulations prohibit public intoxication. Participants in overnight canoe trips must also adhere to the following additional regulations. When camping on the floating platforms or in land based shelters group size is limited to 8. Pets are not allowed on floating camping platforms or in land based shelters. Open fires are permitted only at the land based campsites and must not be within 20ft of the shelter. Open fires are not allowed on floating platforms. Camp stoves are required for cooking on floating platforms. Stoves must be used on metal sheets provided on each platform. Stoves are allowed on land based shelter porches. Each party is required to have a compass, map, flashlight, and portable toilet with disposable bags. The floating platforms and land based shelters can be reserved for only one night. A group can reserve the platforms or shelters at different locations when taking a multiple night trip. A reservation is from 12pm to 12pm. When camping on the floating platforms, pile supported shelters, or land based shelters, each party must have their reservation confirmation number. The floating platforms, pile supported shelters, and land based shelters will be inspected after each use. Damage to platforms will be assessed and be the responsibility of the user. Visitors may be held financially responsible for unnecessary rescues. Platforms and shelters may be reserved for personal use only. Commercial outfitters are restricted from reserving platforms and shelters for re-sale to customers as part of a day use or overnight excursion package. It is recommended to review cell phone coverage for the region for purposes of emergency. Swimming is allowed at the visitor's own risk, and is discouraged in the Delta due to local alligator populations.